I discovered what I could do with all the leftover creme de cassis I had after failing to enjoy kir - turns out that five parts orange juice to two parts creme de cassis is absolutely delicious. And it's the simplest possible cocktail to make, only two ingredients. Much like the ever-popular screwdriver which is orange juice and vodka, except for creme de cassis and orange juice tastes much better than vodka and orange juice. Also it's more French than a screwdriver. Most cocktails hardly seem worth the effort to me, they usually have five or six ingredients, and the results are not always delicious. I think cassis and orange might be the best cocktail ever. Speaking of French alcohol, I recently discovered The Local, aka "France's News in English" which provides this informative Ultimate Booze Map of France. 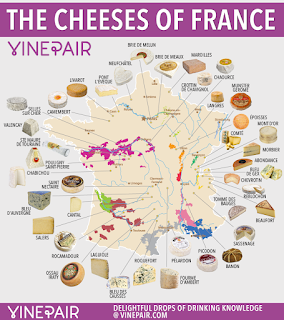 Also handy, this cheese map of France.